Living in a city other than the one you grew up in has its pros and cons. The pros start with the weather, which also gets mentioned several other times on the pros list. One con is not being able to see all your favorite sports team’s games televised. And I knew the Bulls game was going to be on TNT last night. I was killing time cleaning my apartment and anxiously awaiting the game when my phone buzzed with an email. 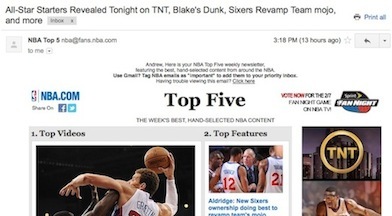 The subject line informed me that the NBA All Star starters would be announced on TNT that night. I quickly grew bored with cleaning and turned on the pre-game coverage on TNT. They had just finished announcing the West starters and had the East starters on the screen. Just then, my phone buzzed again. 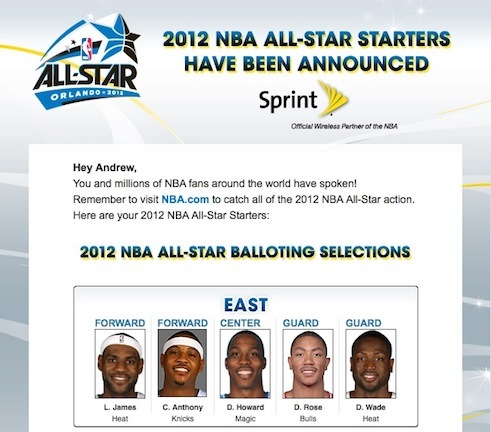 This time, a second email from the NBA showed me who all ten of the All Star game starters were. I liked this second email; one, because I had missed some of the announcement; and two, because I could forward it to my friend who I knew wasn’t watching the game. He’s also a big Bulls fan, and I knew he’d be psyched to see Derrick Rose named to another All Star team. Shortly before tip-off my phone buzzed one more time. It was a third email from the NBA. This time, it was promotions for All Star game apparel. You better believe I perused the selection, and considered a D Rose t-shirt, until I remembered I was going to be in Las Vegas for the Super Bowl this weekend and spending money was not in my best interest. I’m certain most, if not all (probably all), of you don’t care about how my evening went. I don’t blame you. I’m boring. However, you should take note of how the NBA went about the announcement of the All Stars. This trio of emails did exactly what it was created for. The first reminded fans the announcement was being made and where to look. The second delivered the news, for those who weren’t in front of their televisions. The third, once excitement was built from the previous two, got a subscriber to consider opening his or her wallet. The launch of a product or a major announcement shouldn’t be done in just one email. It’s important to build hype, and get people thinking about you. 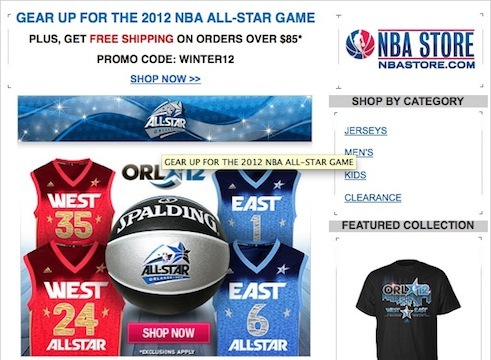 I’m sure if I looked back a few days, there would be even more emails from the NBA starting to tout the All Star game. What are you doing to make your major announcements? The NBA threw down a slam dunk with this one. The ball is in your court now. What Kind of Email Videos Are Appropriate for Your Email?